The trailer for the documentary “Women Are Heroes,” by French street photog JR is making the rounds again, this time in a version for the English speakers. The exhibit itself is over a year old, and part of his 28 Millimètres project, this time focused on women in conflict zones (whether through war, poverty or simply the system). January 12 he’s dropping what’s being billed as the movie of the adventure. The artist, who you learn more about here, does interventions using blown up black and white portraits. 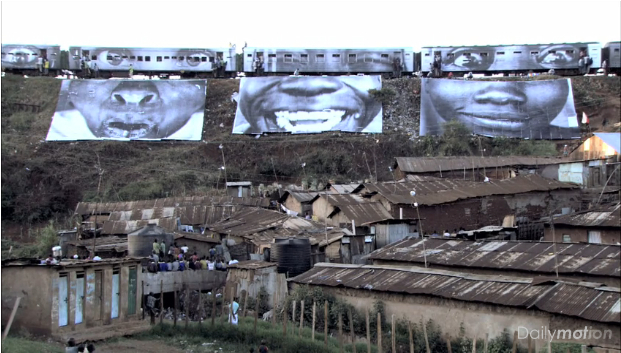 For this project he went to Brazil, Cambodia and the squatter’s village called Kibera in Kenya. This made me think of the tattoo that Tupac had on his chest that read “2.Die.4” under a small Queen Nefertiti image. This project may not be giving political power to the millions of women who struggle in the world, but like one African woman says in one of the video trailers, people will at least wonder who they are, and that gives them voice. At the end of the day, John and Yoko knew what they were talking about with that song.